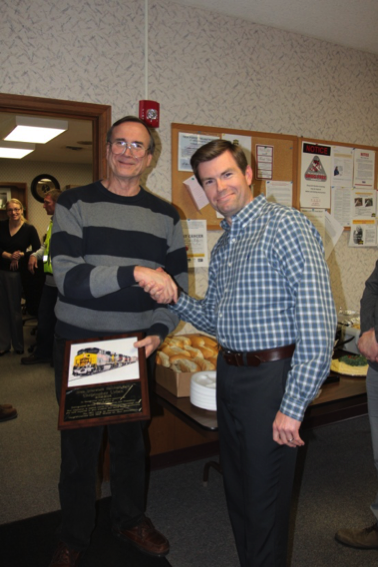 Chris Urban Retires - Iowa Interstate Railroad, Ltd. Chris Urban Retires - Iowa Interstate Railroad, Ltd.
On March 31, veteran railroader Chris Urban retired from the Company. Chris’ railroad career spans 48 years with six railroads: Milwaukee Road, Soo Line, BN, Wisconsin Central, CN, and the Iowa Interstate. As Director of Safety Rules and Training, Chris updated our safety rule books, timetables, and GCOR books. But Chris’ main and lasting contributions were in conducting training classes, especially those for new train service employees. Chris’ hands-on style in combining classroom training with field exercises has set the next generation of railroaders on the solid path of safety. Chris has trained over two thousand individuals who remember well his impact on their lives. Merci and bon chance, Chris.